Over 9 percent of the U.S. population has diabetes. That’s nearly one-in-ten Americans. The overwhelming majority of these people have the preventable diabetes Type 2, which can be tackled with some lifestyle changes such as an altered diet and increased exercise. Around 5 to 10 percent have Type 1 (which may actually be improved by flaxseeds, according to recent research). While these two conditions are very different, they do have some things in common, namely the difficulty in controlling blood sugar. Side note: Type 1 diabetes was formerly referred to as “juvenile diabetes”. That term had to be rethought when children began developing the wholly preventable and lifestyle-associated Type 2 diabetes. A study published in the journal Diabetes Care in 2003 found daily consumption of cinnamon had positive effects on blood sugar, along with several other markers. 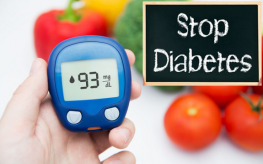 The 40-day study period concluded with reductions in blood serum glucose levels of 18 to 29%. But it also worked to reduce triglyceride levels (23-30%), LDL cholesterol (7-27%), and total cholesterol (12-26%). Cinnamon for diabetes could be one of the most effective known dietary solutions out there. Because oatmeal is a slow-digesting carbohydrate, it won’t raise blood sugar levels as quickly or as much as other carbs. It’s a better option over white toast, for example. In addition, it can help control weight, a factor in the management of diabetes Type 2 specifically. Like oatmeal, broccoli is high in fiber and is a good replacement for other starchy options. Vegetables like potatoes and corn, for instance, can cause spikes in blood sugar. In addition, broccoli is a good source of chromium, which has been shown to help stabilize blood sugar levels. Ginseng, a root, has been shown to lower fasting and post-meal blood sugar levels. It can be added to the diet as a tea or found in the supplement aisle. Salmon is all protein and no carbohydrates, a good mix for blood sugar regulation. Further, it is rich in Omega-3 fatty acids, which are great forboosting heart health—something diabetics must be cautious of. Like broccoli, salmon is also a good source of chromium. When it comes to controlling diabetes, we often think of what is on the do not eat list. But foods like these are important additions that can improve your health and make the disease easier to manage.